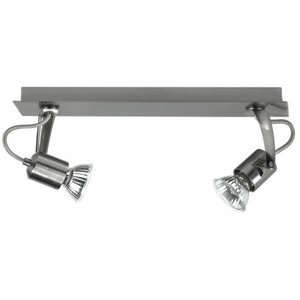 This well-mountable spot with 2 lamps in brushed metal is supplied with the matching light sources. This allows you to enjoy the pleasant light that this product produces in no time at all! Due to the handy size of 70 x 125 x 315 mm. you can fix this spot with 2 lights in brushed metal in different places. This practical lighting product works on 230V ~ 50Hz. * Suitable for any interior. * Well mountable and including light sources. * 70 x 125 x 315 mm.